Going through the results, I have a few things to note on Saturday’s results. So I would have won the second race against the Slovenian, though one has to note that he won by a huge margin. I met him at the dinner restaurant, where he was sitting at the table next to me. In rudimentary English he explained that the single had been a tough race because of the heat and the sun. Well, who knows. In the D-F category nobody rowed faster times than in the A-C category, but these were rowed in the afternoon. The fastest time was by Akai (50 years) who rowed a 3:41.50 beating Cernak by 1.8 seconds. Both are excellent scullers. Fastest time in E was 3:48 and only from F upward the results were above 4 minutes. There is a bunch of fast scullers in this country. I would also like to mention the oldest single sculler, 73 years old, who rowed an excellent 4:37 time. On to the quads. The first heat, A category, was won in 3:04, with a 6 seconds margin. We rowed 3:05.70. I think my crab cost us 2-3 seconds. We missed about 4 strokes but the boat was going fast and doesn’t stop immediately. 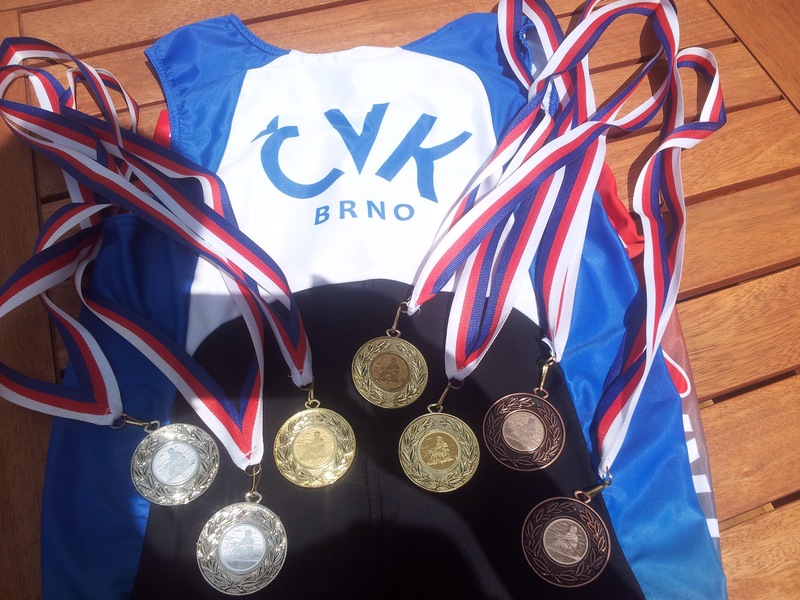 What is interesting is that in the C category there was a Austrian/Czech composite with 2 scullers from our club who wanted to make a fast quad and went abroad to find some fast scullers. 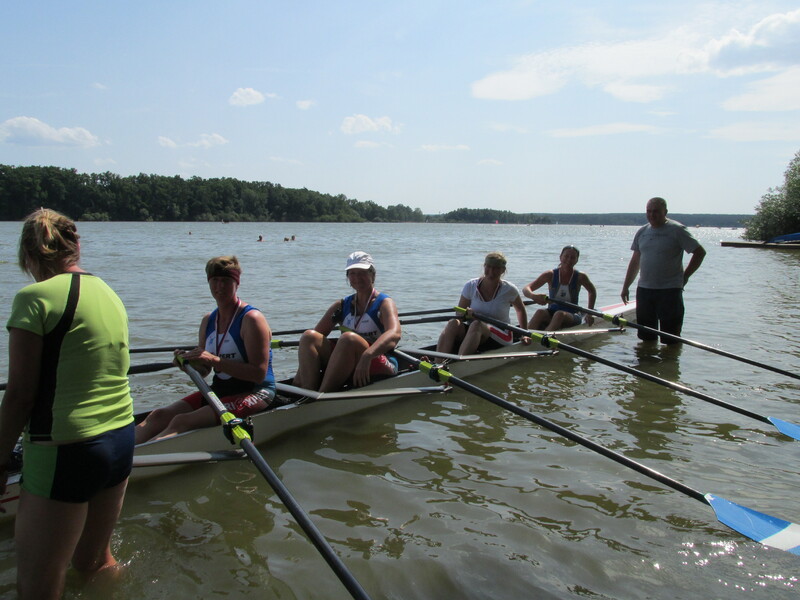 They rowed in the same rainshower as we did, 10 minutes behind us, and finished second place, 3:09.71, four seconds behind the winner in their category, and 4.2 seconds behind us. 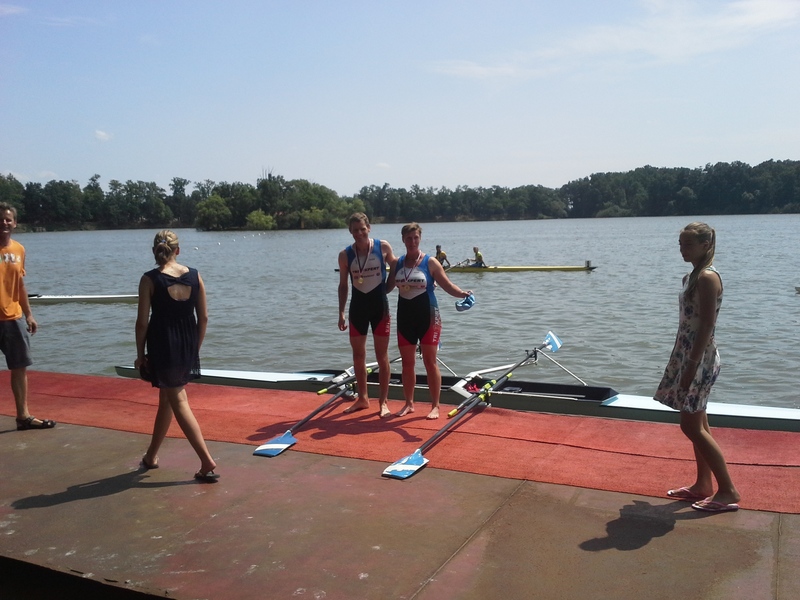 As their race was a combined race with 3 C boats, one D boat and one F boat, they didn’t get a silver medal. Suffice to say they weren’t very pleased. This was the fun race of the weekend for me. 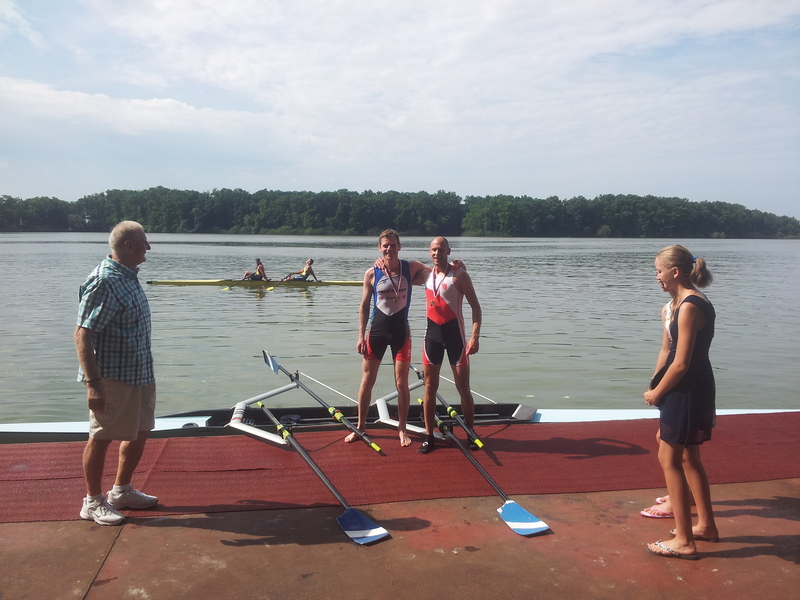 I am rowing with Radek, a self-taught sculler from the other side of the lake. I am happy with how we row but of course there is room for improvement. I considered ourselves an average competitor in our B race of 4 boats, the 7 entries divided in two races of 4 and 3 boats respectively. We were starting against Neratovice (one guy from the quad that had beaten us on Saturday), Breclav who we had beaten easily in Hodonin (but they claim they are much faster now), and Blesk (unknown). This was Radek’s only race of the weekend. 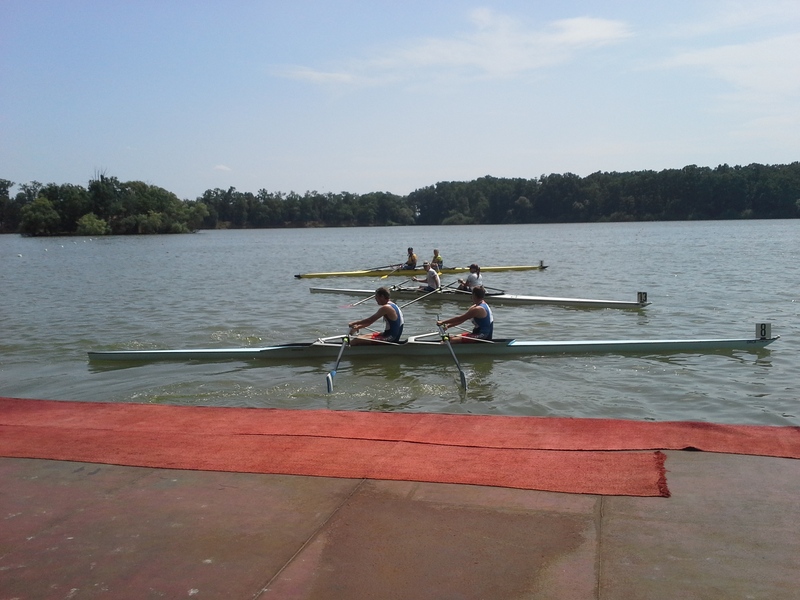 A year ago he started in the single and had flipped, rowing in third position. This year he lacked the confidence to start in the single and decided to row only the double with me. Of course he was nervous as hell. And when he is nervous he tends to push too hard, dig his sculls deep and waste a lot of energy in the first half of the race. So I told him the race plan was a fast start but then settle quickly in a sustainable pace and focus on light catches, blades not too deep. We would start “racing” at the 500m mark. I told him to not watch the competitors and keep his eyes in the boat. Conditions: 25 degrees at 10 AM. It felt more like 30. Slight cross/headwind. We started well but the “false start” sirens went off and we had to get back to the starting line. Blesk in the lane next to us had moved very very early. Our second start was slightly worse but acceptable. I lowered to 32spm and started to focus on technique. We were in first position and gradually pulling away from the others. With 500m to go we were leading by a length and a half. I decided to not increase the pace, just continue to row. 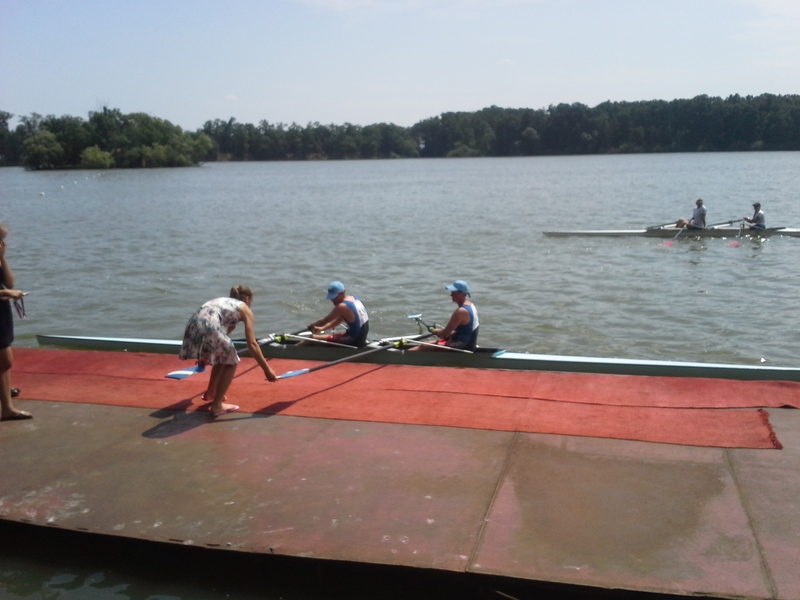 With 300m to go I noticed that Neratovice were gaining on us so I called “finish” and increased the stroke rate. I was comfortable but Radek behind me was already out of energy. Still, we won with a 4 seconds margin. 3:34.50 is not a fast time in the double but it was enough to win. We would also have won the other B race (winning time 3:41). 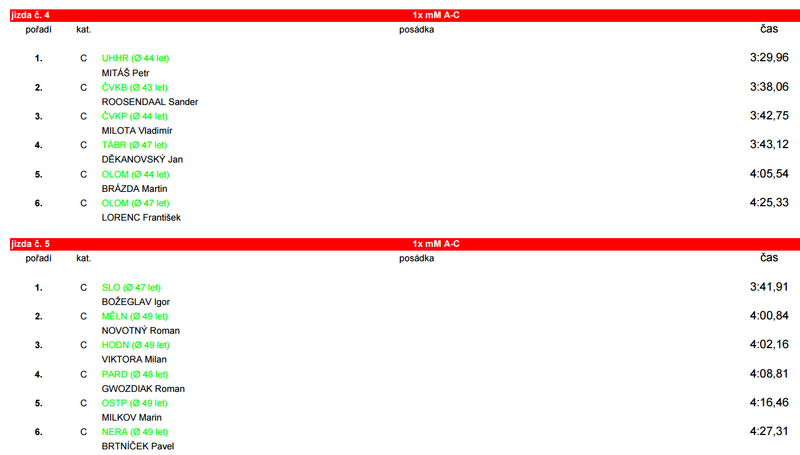 The mixed double race with Romana was scheduled at 14:10, three hours after the double race with Radek. So again I settled in the shade under the tree and tried to recover, rehydrate and get some quick energy in my body. We were up against some pretty quick couples and Romana was quite scared. I was joking that we would win easily. First, Romana has made a lot of progress on the erg over the winter. Second, we have a lot more training kilometers together than a year ago, and last but not least she’s rowing with a fast sculler. I had an eyewitness report that the lake was full of mixed doubles practicing on Saturday evening, when we were enjoying good food and wine in the historical town center. I found that comforting. The mixed double is a difficult boat to row because the stroke profile is a compromise between two rowers with very different power and usually also different length. One of our competitors, a Mr Zeman, was constantly walking around us, showing his impressive torso and his very minimal swimming trunks. We also met our friends from Pardubice/Olomouc Mr Karel Nevrala and his partner Vendula Vecerova. They beat us a year ago by a minimal margin of 0.5 seconds. The wind had changed to a clean tailwind, causing quite significant chop on the lake. Temperature was a “moderate” 33 degrees C.
There were 10 competitors in the Masters C category, so they had broken it in 2 races with 5 entries. In our race, they had added the single entry in the A category. These guys just had to row the course and get a medal, and their result wouldn’t influence the results of the battle in the C category. Rowing up to the start, Romana was telling me who the competition was and how fast they were. Basically, they were all dangerous. Our practice starts were dramatically bad in the chop. Luckily, the real start was back to our normal standard and we were fast away from the starting line. Lane 1, the A category, was leading, we were in second place and Karel/Vendula were just slightly behind us, immediately followed by Ostrava and Smichov (the “impressive torso” man). Neratovice was falling behind quickly. But I had a good feeling. Romana, when she’s working hard, has a very distinct breathing out just before the finish, so we were rowing like a steam train. Our ORCA double was jumping forward on each stroke and we were slowly but surely rowing away from Karel and Vendula. The A boat was half a length ahead of us. By the 500m mark we had beaten all our C competitors in theory. In the chop, one mistake by us would bring them back in the race. This being our last race of the day, I decided that I wanted to beat the A’s as well, so I asked for a “10 strong strokes” when we were passing the 500m mark, and we passed the A boat in lane one. Now we were leading by half a length. The chop increased towards the finish line and the A boat was catching us back. I called for a finish with 200m to go but our steering was a bit erroneous. In the final 5 strokes we ended up in the buoys and the A boat passed us. I wonder if we would have fought harder if they would be C’s. I dare to say so. Anyway, we did it. YAY! And look at the fast time! Granted, rowed in a tailwind, but, on the other hand, in difficult, choppy conditions. Our home lake can be choppier, but still this was not easy. Of all the mixed doubles that started that Sunday, we had the second time. The other C race was won in 3:35. The B’s was won by Mitas/Tomastikova in 3:29 and the fastest time in the D-F mix races was 3:39. No race stats. I forgot to press start in the CrewNerd app. Too much focused on the race. 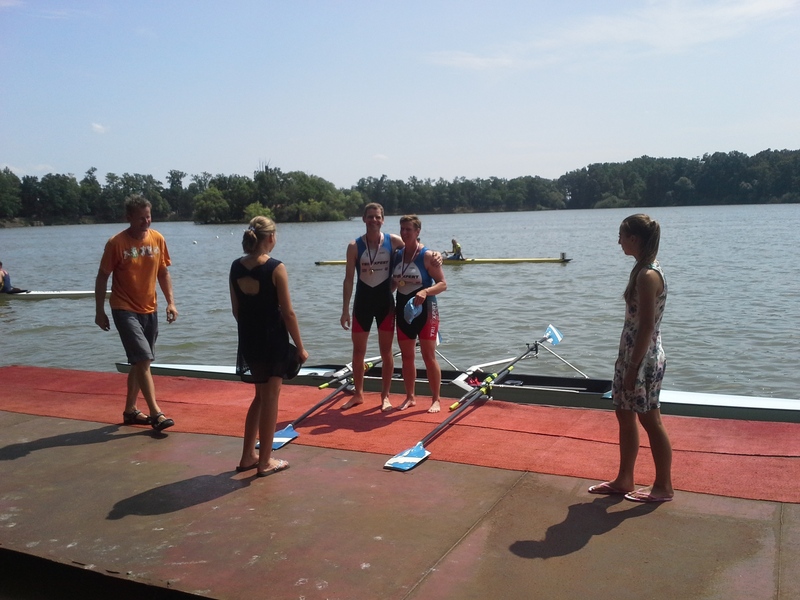 I had a victory beer and started to prepare the boat for transport, but Romana had to row another race, the C ladies quad, one hour after our start in the mix. She was stroking it.